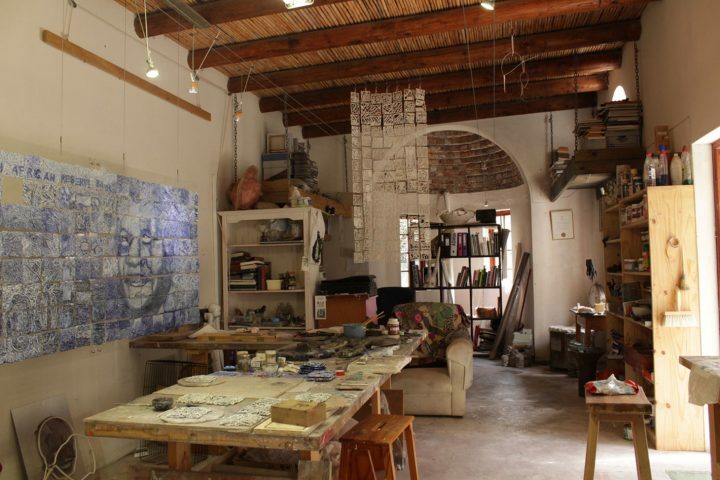 This week, artist studios in Austria, Florida, New York, and South Africa. 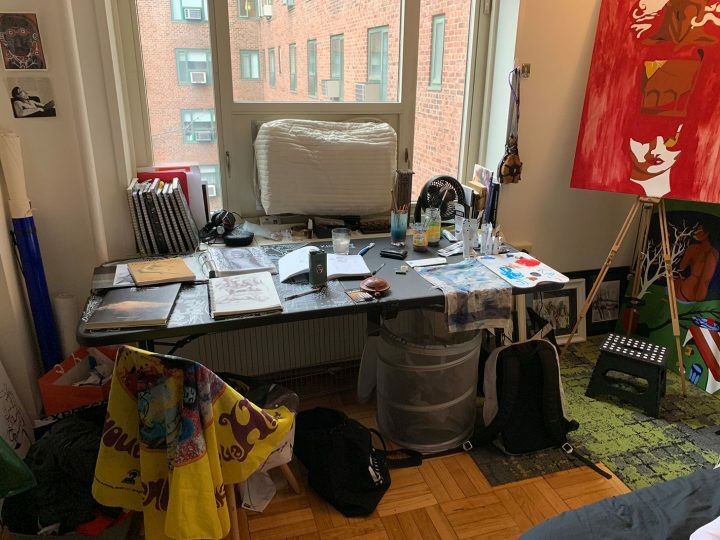 The 139th installment of a series in which artists send in a photo and a description of their workspace. Want to take part? Submit your studio — just check out the submission guidelines. My studio is in Noordhoek, 30 kilometers outside of Cape Town. It was built in 2000 as a workspace, so it is well suited to the range of materials and processes I use in my art making practice. I have a small test kiln as well as two large tables to work on, dry clay, and assemble pieces. I work with moulds so I can work with messy materials like slip casting clay and plaster of Paris. It also is a special sacred space to me, as I can mull, meditate, ponder, and day dream in my comfortable chair and get inspired. Outside, I have a mosaic pathway that leads to the house, and outside the door to my studio I have the word “imagine” written with a small pebble mosaic. I love my space and am extremely grateful for it. This is my section of the Bed-Stuy studio I share with five other female artists. Together, we have built open partitions, a setup that simultaneously allows for enough privacy when creating, as well as an uplifting collective experience. This energy inspires us to work individually and as collaborators. The photo depicts what my space looks like when I make a collage. 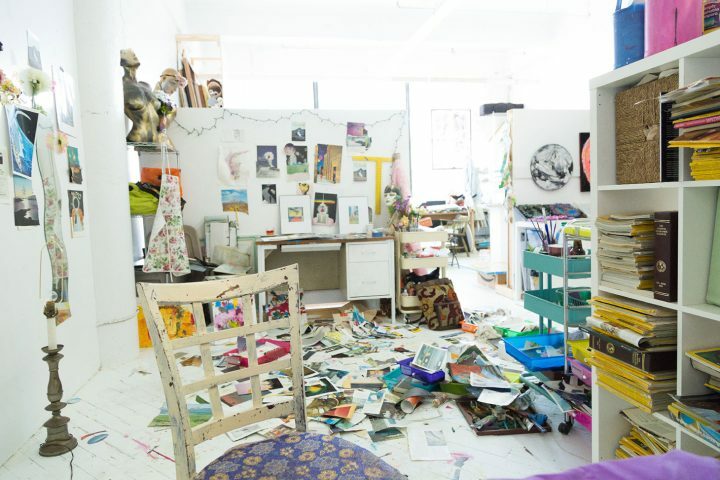 The messiness is a direct metaphor for the messiness of the expansive inner world that I investigate in my work. Collage as a medium is inherently similar to the unconscious as it layers pieces like the psyche stacks experiences. To explore this relationship in the most natural way, I apply an automatic process. Ripping out hundreds of vintage magazine pages without organizing my thoughts, I spread out my finds on the floor. 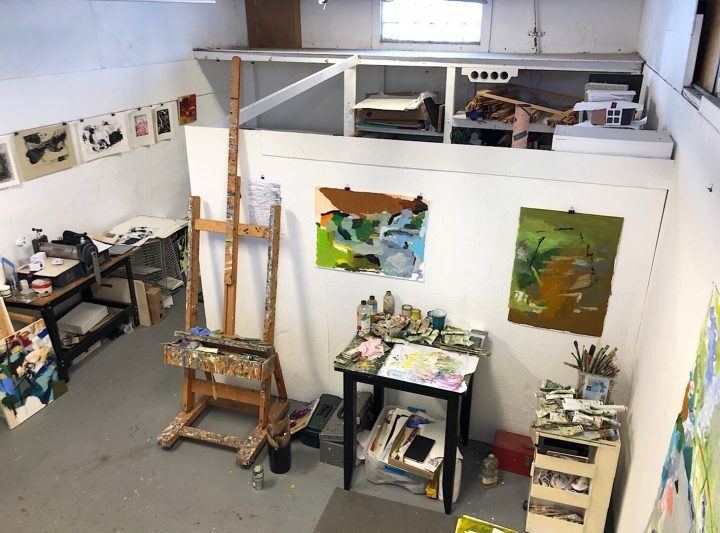 While drawing from my own unconscious, the shared studio space, along with using found material, supports a picking process that is connected to a collective consciousness. The method of initial expansion ultimately leads to contracting all the stimuli into an integrated form, the actual piece. Reassembling the set of materials, or experiences, I juxtapose what doesn’t usually go together, allowing the psyche to re-understand itself. This is a shot of my studio at the Bakehouse Arts Complex located in the Wynwood Arts District of Miami, FL. You can’t see me, but I’m standing on top of my mini-fridge in the corner. What you can see is the easel that I’ve had since 1996. I still use it, but I also like working on the wall. Arches paper for oils allows me to work big, but save on space. The area behind the partition is storage, and that is filling up. My etching press is visible along with some prints I recently made using a water-based lithography technique.If you look really carefully, you can see a pink cylinder coming up from behind the partition. My uncle was a painter who died in Miami in 1987 during the first wave of the AIDS crisis. He made it for me in 1973 (I was two). When I opened it, confetti popped out. He’s why I’m an artist. We were from north of Boston. I moved here two years ago; it was sort of a coincidence. My name is Alejandro Otaola. I am a young artist from Venezuela, living in the Lower East Side of Manhattan. I have been drawing obsessively all my life and have taken to scaling up my creative process with the use of bright colors expressed in my paintings. For this, I need a studio that supports a good drawing space, complete with drawing books, stacks of sketchbooks, and artistic inspirational books (seen on the left side of the picture), as well as a painting section (right side), with a canvas — any canvas stand I can afford — and paints. This gorgeous studio in the historic LES of Manhattan also doubles as my room. Off camera sits my bed and stacks of clothes. Under the table you see my laundry basket. On top you’ll be greeted by miscellaneous objects, which have found themselves a home in my studio — lighters, tobacco, pipes and flasks, as well as books, cough medicine, and candles, all under the nice view and daylight. Due to the cramped quarters, storing my work becomes difficult, which is why some pieces end up right by a new work in progress, as seen in the lower right corner. 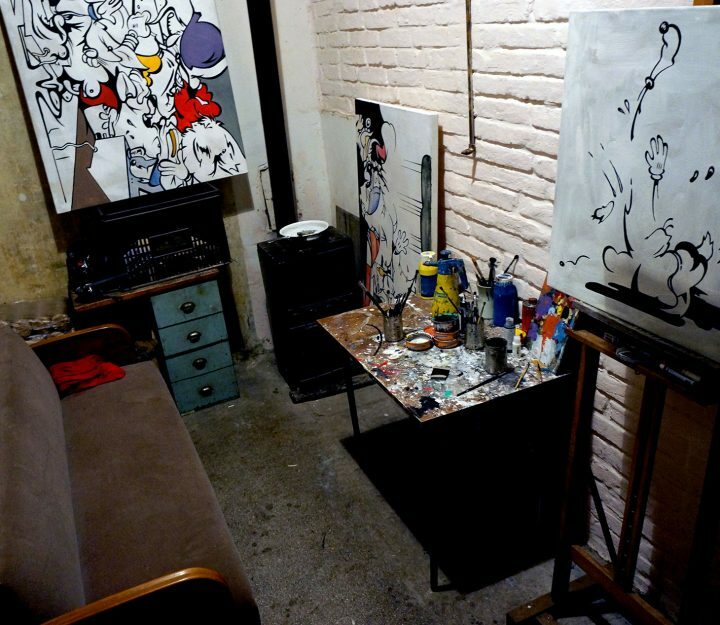 This is my studio in the backroom of a former seedy bar in Vienna, Austria. When I got the place, there was a thick brown layer of nicotine on everything inside, like varnish on old paintings. It’s my 40 square-foot playground — no sunlight, no room for all my stuff, but this is where magic happens with me.